"I am forever evolving into a better and happier person." 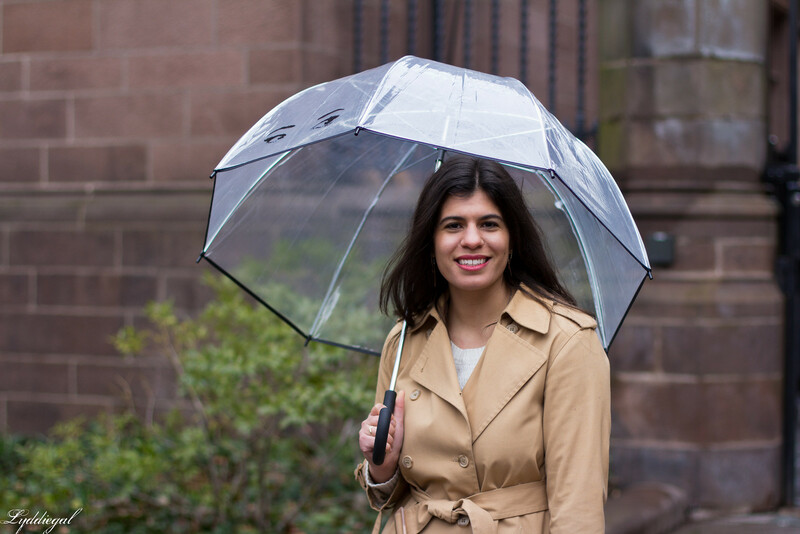 The month certainly started off with quite a bit of rain, and while I tend to shy from photos in the elements, it was free cone day at Ben and Jerry's, and even when it's dreary out, I can't miss an opportunity to take photos in downtown New Haven by Yale. It also gave me an excuse to show off my adorable Kate Spade umbrella. Admittedly not quite as convenient as the kind which collapse small enough to be tucked into a purse, but so much more fun. 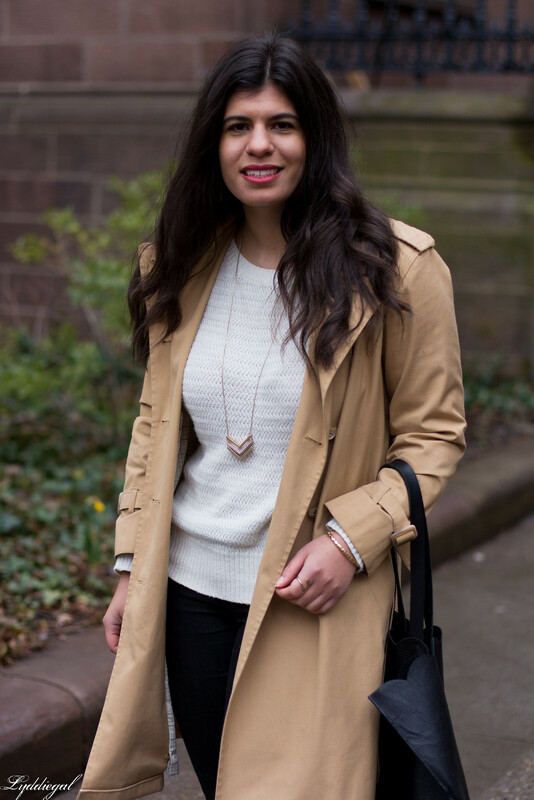 THE PERFECT spring outfit! ANd how adorable is your umbrella? Love it! I like the idea of a clear umbrella, though Lydia---even if it is bigger than our others!! Then you can pull it down in front of your face and still see where you are going!! I love your tote! I need to order that! That umbrella is just awesome - I love it! Oh that umbrella is just the cutest! But it is one of those paradoxical umbrellas - the non-foldable ones are always way cuter and more fun, but carrying around a big umbrella all day is just such a pain it almost doesn't make it worthwhile. Although for this specific umbrella, I think I'd gladly make the exception, especially because it's clear, which means you can probably walk with it and still sort of see where you're going, which is always an added bonus ;) I love how the umbrella works into the whole look, too; you really can't go wrong with a cute umbrella and trench coat combination, as far as I'm concerned. why can't they make a bubble umbrella that collapses? or, why can't they make a collapsible umbrella out of clear plastic or something??? lol. 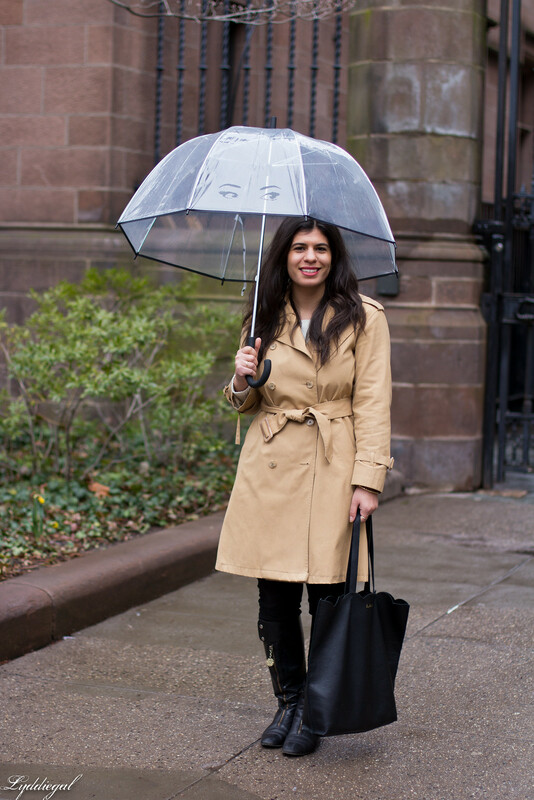 That is such a cute umbrella, and I love your trench too! You still manage to look chic even in the elements. 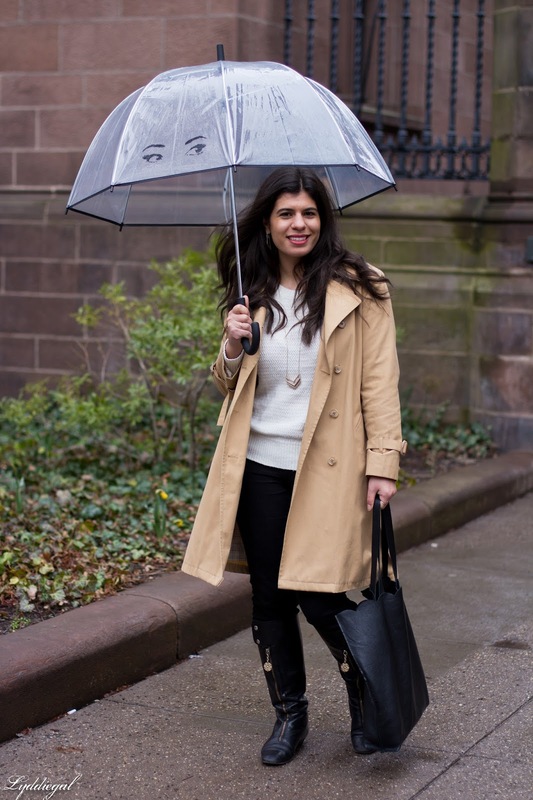 That Kate Spade umbrella is adorable! I got my free cone at Ben and Jerry's too! 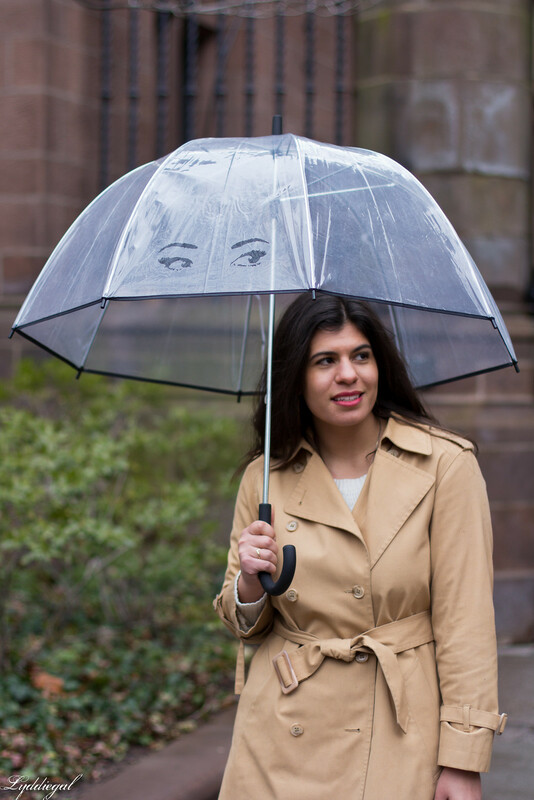 This umbrella is super cute - much better than those collapsable kind! 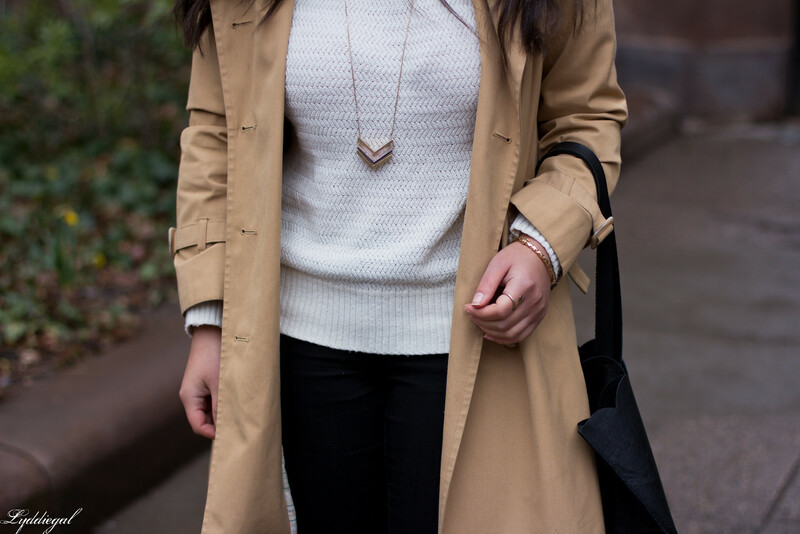 This is the perfect rainy day outfit in my opinion! I am pretty sure you were the most chic customer there... that trench is fabulous and you just reminded me that I need to pick up a decent umbrella.